Rare Villa in desirable Gated and Golf Community with Water View. End unit on corner lot means a big yard! Light and bright with lots of windows. Open floor plan with 3 bedrooms, 2.5 baths, and a 2 car garage features generous room sizes and closet space. Large kitchen features spacious Corian countertops, tons of wood cabinets, a view of the water. Large master suite also has water view. Laundry room w/working space. Beautiful upgrades throughout including gorgeous bathrooms, tile roof, plantation shutters, volume ceilings. Beautiful screened in patio with lovely pond view. Maintenance free - yard, exterior and roof all covered in HOA. Located in The Eagles Royal Troon community. Features beautiful golf course and clubhouse, basketball, tennis, playground, and more. 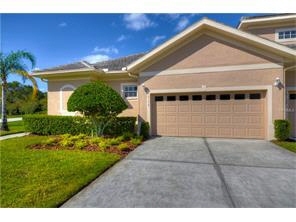 A-rated schools, near Westchase, freeways, shopping, and dining.